Voted the best SME Telephone system in the market. From 4 to 2000+ Users. 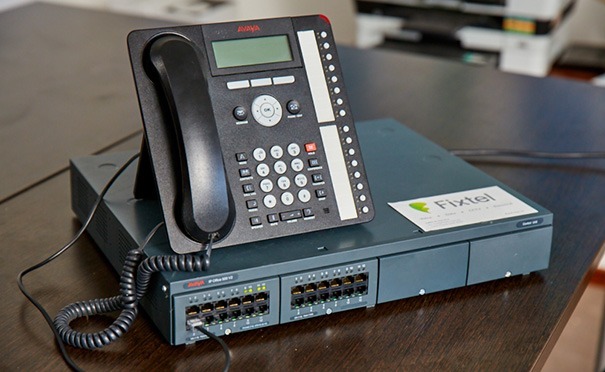 Fixtel have been selling, servicing and installing Avaya phone systems for over 25 years. Avaya telecommunications systems have been around since digital Internet technology started to replace the more old fashioned analogue systems that were most common up to the late 90s. With a vision of how the Internet would be able to change the way people and organisations communicate, the company has been leading the way especially as a Voice Over IP (VOIP) solution provider. Many business owners have the false impression that hosted and cloud based IP phone systems are only suitable for large businesses with dozens of employees and a receptionist working at a front desk to direct calls to different people and departments. However, nothing could be further from the truth. Avaya phone systems are perfectly suitable for businesses with 4 to over 2000 extensions. And as your business grows to multiple locations and offices, your phone system simply adapts and grows with you. Because of the long standing relationship with everything from start-up businesses to large multinational corporations, Avaya is able to provide a seamless experience for customers and employees alike. With the highly flexible Avaya IP Office 500 telephone system solution you can take full advantage of voice, video and mobile communications for your team and customers. Whether you’re a small local service provider or have a multi-site integration, the experience for all communication needs will be flawless. Features that in the past were only accessible with huge IT budgets are now provided across the board allowing for far more effective communication at all levels. When it comes to telecommunication equipment, one of the key factors should always be scalability. During any expansion phase of an organisation you simply cannot afford the risk of your phone system standing in the way of your growth plans. As you increase your headcount you will need to add corded and cordless handsets along with conferencing features and chat and email integration. And when this can be done through seamless upgrades, remote configuration and added hardware, you won’t see any disruptions to operations. These features are available to you even from the smallest and most basic setup available. They no longer require communications budgets running into the hundreds of thousands, and simply allow you to become far more efficient at what you do. In comparison to many other office phone systems, Avaya truly brings flexibility. You don’t have to worry about your telecoms keeping up with your pace of growth and expansion, as expansion can be easily planned and implemented. This means that small companies or those with a tight start-up budget can implement an entry level configuration at low cost. And as soon as you have a proven track record and path to success, you can invest in upgraded specs and hardware. Here at Fixtel we also offer very flexible options to buy, rent or lease equipment. This is a significant advantage over other managed phone system providers as it gives you the flexibility to keep upfront costs down through lease or rental agreements. Pricing is entirely dependent on the configuration and specs required, but many of our clients that are entering growth phases will take advantage of this financial freedom to focus on other areas of the business at the same time. Here at Fixtel we are able to support clients throughout Australia including Brisbane, Sydney, Melbourne, Perth, Adelaide, Canberra, Hobart and Darwin, and even some very remote locations. Because most servicing and troubleshooting can be done remotely, your location really isn’t an issue for our technicians. We can configure most functionality without having to visit your site or disrupt your operations. If you need help with identifying the best possible solution to provide you with the best return on investment, then our 25 years of work with businesses like yours will be a huge advantage to you.We know exactly how to keep your costs down while still providing all the functionality that will help your team work more effectively together and with clients. With full service packages available to provide help desk support and 24/7 emergency help, you can also avoid lengthy system downtime in the event of failures or performance issues.